What Is A ‘Kos Minar’? | This Jaipur! 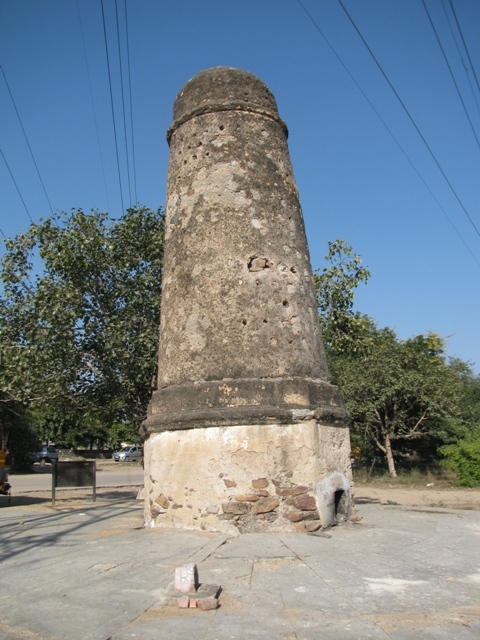 Kos Minars or Mile pillars used to be the mile stones on the Mughal Highways or trade routes which inter-connected the Mughal Empire . They were first made by Sher Shah Suri to mark the distance. A kos measures 2 miles of distance. The distance between two Kos Minars was approximately 4 miles. They were more than 30 feet high round pillars of masonry. The design might have varied slightly but their function was the same. They were later on instrumental in day to day governance of the Mughal Empire as they had horses and riders and drummers stationed there for relying royal messages at speed. They also developed as travelers hubs as step-wells & ‘sarais’ were built nearby. The routes on which these Kos Minars were built had been there for ages. Consequently they are near famous battlefields and monuments and ancient cities. Also modern highways have taken place of the ancient tracks used by Mughal horsemen. They were mostly built during 1556-1707 AD. In 1575 Emperor Akbar issued an order, as stated in Akabarnama by Abulfazal, that Kos Minars should be built on the way from Agra to Ajmer to act as guide posts to travelers. Later on Jahangir & ShahJahan had these pillars built along the major routes connecting the Mughal Empire. One of these Kos Minars still exists in Mansarovar near the Veer Tejaji Road Circle in Jaipur. There were about 3000 km of highways in the Mughal Empire. So there should have been about 1000 Kos Minars in the Mughal Empire. Their numbers have diminished over the years due to urbanization etc. Nowadays these monuments are protected by the Government of India, coming under the purview of the ASI. In February, 2005, a first day cover was issued depicting, a renovated, Kos Minar as a symbol for Heritage Conservation. Another view of the Kos Minar situated near the VT circle in Mansarovar in Jaipur. This entry was posted in Around Jaipur, GuestHouse, Jaipur, Jaipuri, monuments, rajasthan, rajasthani and tagged Agra, Ajmer, Akbar, Delhi, Jahangir, Jaipur, kos minar, mile pillar, mile stone, Mughal Empire, Sher Shah Suri, Taj Mahal. Bookmark the permalink.